Dropped by Mushroom XIII No. 2, No. 4, No. 6, No. 8, No. 10, and No. 12 (55%/65%). "A shield with a little strength." Dropped by Mushroom XIII No. 2, No. 4, No. 6, No. 8, No. 10, and No. 12 (35%/75%). 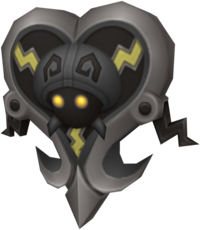 The Joyous Mushroom is a shield that can be wielded by Goofy in Kingdom Hearts II Final Mix. It can also be found as the Joyous Mushroom+. The Joyous Mushroom is shaped like a shorter version of the Heartless emblem; its basic shape is that of a large heart with a short fleur-de-lis on its bottom. Its edges are grey and the face of the shield is dark grey with three grey, zig-zagging lines decorating it. Superimposed over the shield's face is the head of one of the Mushroom XIII. 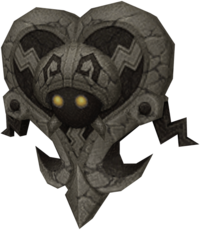 Its "hood" is grey with dark grey, angular spirals on it, its face is black and its eyes are yellow and seem to glow. The tips of its hands are visible under its head. There is also a short, black, zig-zagging spike on either side of the shield. ↑ The Mushroom XIII No. 2, No. 4, No. 6, No. 8, No. 10, and No. 12 drop a Joyous Mushroom 55% of the time if they are satisfied at rank E, and 65% of the time if they are satisfied at rank D.
↑ The Mushroom XIII No. 2, No. 4, No. 6, No. 8, No. 10, and No. 12 drop a Joyous Mushroom+ 35% of the time if they are satisfied at rank D, and 75% of the time if they are satisfied at rank C.